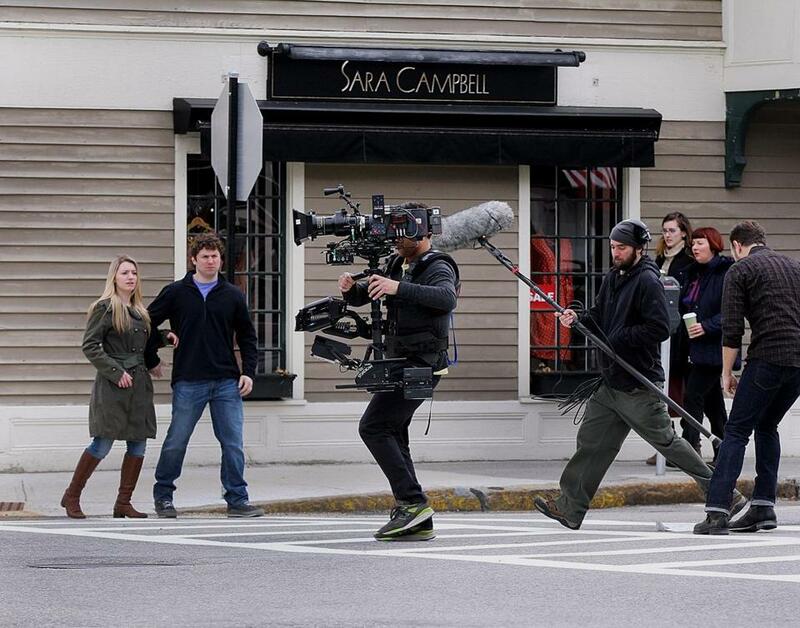 Cast and crew from “Tumbledown” took over a street in downtown Concord while filming an outdoor scene in April. Losing the lease to the family bakery’s landmark location of 61 years in a central part of Quincy and moving to a less traveled part of town four years ago has been difficult on Brian Jackle . Foot traffic once attracted to O’Brien’s Bakery by Jackle’s concoctions, like the doughy fusion of peanut butter, banana, and chocolate he dubbed Elvis Bread, is much harder to come by at its new location on Vernon Street. But like a Hollywood fairy tale, Jackle got a break a few months ago when a baker friend of his in Somerville recommended O’Brien’s to the craft service team in charge of feeding the crew on the set of “The Finest Hours,” a multimillion-dollar Disney production filming in Quincy and Duxbury. Four hours of giant sandwich-making helped establish a relationship between Jackle’s family-run business and the film’s food and beverage contractors, who have continued to place orders with the bakery, including a recent request for 100 bread bowls to go with 4 gallons of steak chili and 2 gallons of broccoli-cheddar soup made by Jackle’s mother, Muriel. Sampling of how some local businesses and organizations have profited from the local filming industry. While the latest report from the state Department of Revenue indicated that most of the spending attributed to the Massachusetts film tax credit in 2012 went out of state, proponents of the initiative say that an increasing number of locally filmed productions have spread out beyond Boston, helping small businesses and tourism in the suburbs from Lincoln to Quincy to Saugus. The number of major productions — those with budgets over $250,000 — filmed in the state annually has more than tripled since 2011, going from nine to 30 this year, according to the Massachusetts Film Office. And from 2011 to 2013, film production took place in 108 Massachusetts communities, boosting local businesses from restaurants to hardware stores, said Lisa Strout, director of the film agency. One indicator that Massachusetts is coming into its own as a filming destination is the construction of the $41 million New England Studios, led by Chris Byers and a group of investors. The complex, which opened last year and now is on its second movie, features four sound stages totaling 72,000 square feet in the former Fort Devens Army base, which straddles Ayer, Harvard, and Shirley. For Jackle, getting the call from craft service for “The Finest Hours,” which is scheduled to continue filming locally until January, has turned into an unexpected lifeline. Any time an order comes in from the set, it’s in the hundreds of dollars, he said. The mobile, unpredictable nature of the movie-making industry makes it difficult for the state film office, local chambers of commerce, and visitors bureaus to measure a production’s full economic reach in the communities where they film, Strout said. But one indicator, she said, is the growth in membership in local film and television unions, among them the International Alliance of Theatrical and Stage Employees Local 481 , headquartered in Woburn. In 2006, when the state’s film tax credit went into effect, the union, representing behind-the-scenes workers such as set builders and electricians, had 325 members. It now boasts about 900, said business manager Chris O’Donnell. O’Donnell contends it wouldn’t have happened if not for the tax incentive, which critics have said doesn’t benefit the economy enough. Under the incentive, filmmakers who spend more than $50,000 locally qualify for a 25 percent payroll tax credit; spending more than 50 percent of a project’s total budget or filming at least 50 percent of principal photography in Massachusetts qualifies projects for a 25 percent production tax credit and a sales tax exemption. One example, he said, is “The Equalizer,” a thriller starring Denzel Washington that opened in theaters in September. 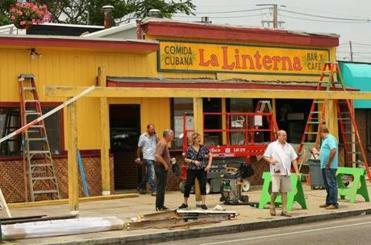 It was filmed last year, with locations including a former Lowe’s store in Haverhill. Members of Local 481 were in charge of the vendor lists for everything from set construction materials to props and food, he said. “For ‘The Equalizer’ alone, there were vendors and businesses in 45 different communities that came off that list,” O’Donnell said. Since 2008, members of Local 481 have made production-related purchases in more than 3,000 local businesses, many outside of Boston, O’Donnell said. Among those members is the duo behind Team Crafty , a Lincoln-based craft service business started by David Steinwachs in response to the growing local film industry, said co-owner Cam Goodrich. A lot of the food and drink on set is purchased at warehouse clubs and local supermarkets, but Steinwachs and Goodrich try to get as much as possible from small businesses and restaurants, Goodrich said. On average, their food budget is $950 to $1,900 a day to feed 100 to 200 people on a set, he said. Paul Delios, president of the 60-year-old family-run Kane’s Donuts in Saugus, said he has delivered orders for 300 doughnuts on a weekly basis for the past three years to many of the sets where Team Crafty has worked, including current productions. Each dozen costs $16. “It’s not a huge part of our business, but it’s a nice extra,” Delios said. Even long after productions have wrapped, the local economy still benefits, said Taunya Wolfe Finn, owner of Wolfe Adventures and Tours in Newburyport. Since a movie-themed component was added about two years ago, Wolfe said, it now makes up 10 percent of her group tour business. Wolfe Finn said she makes it a point to bring visitors to places where they can spend money, such as Woodman’s of Essex , a seafood restaurant where parts of the movie “Grown Ups” were filmed in 2009. If a 45-person tour group, for instance, has lunch there or at any local restaurant, it can easily add up to more than $1,000 for the business, Wolfe said. Though movie contracts are only 3 to 5 percent of Sayan’s business, it can be a big help.